This card is for the sketch challenge over at Our Creative Corner blog...I hope you like it! I think it would make a great card for mass production. 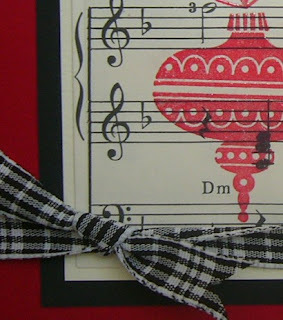 I layered the sheet music on a piece of cream cardstock before the black layer. And, the ornament is embossed before I stamped the "second" generation of it. The beautiful red cardstock is from The Angel Company and I love its deep hue. All stamps and papers (other than my sheet music!) is from The Angel Company. So cute! Love the sheet music idea! Beautiful! How clever to use the sheet music! OMGoodness! this is stunning :0) i think your music book was perfect to use!! thanks for joining us for the sketch challenge this week. HI Chris :) Thanks for taking a little break to play along with our sketch challenge! Your card is beautiful, I LOVE the creative design and layout! Thanks for playing along with us, hope to see you next week! Beautiful card! I love that combination of the stamp and the music paper. Thank you for playing along with Stamps and Smiles. I hope you will join us again next week. Subscribe to my FREE Newsletter! Find out about all of the latest specials, exclusive offers and free "how-to's" first! For orders over $150 please contact me directly - you have earned FREE merchandise and I must place your order for you!